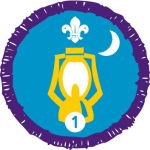 The Nights Away Staged Activity Badge is earned by taking part in overnight activities within Scouting. The Nights Away Staged Activity Badge is earned after completing 1, 2, 3, 4, 5, 10, 15, 20, 35, 50, 75, 100, 125, 150, 175, and 200 nights away. A night away is classed as a recognised Scouting activity such as sleeping under canvass in a tent, in a bivouac, a hostel, on a boat, or at a Scouting activity centre. If an Explorer Scout is a Young Leader (YL) then they can earn nights away towards this Staged Activity Badge when they complete nights away on camps and events with their YL section. For example, a YL staying on Cub Camp. Explorer Scouts who participate in camps, events, and nights away as a Young Leader should inform their Explorer Scout Leader of these events so that the nights can be recorded.